<?xml:namespace prefix = w />This section includes products that are primarily intended for new construction or renovation applications. The rough-in boxes and tubing to connect the boxes are installed during construction and then fan units and grills are installed at the trim out stages. Planning for cooling during construction makes the trim out very quick and easy. Duct Box - 4x4 (VS-WDB-HFL) - This box is for use with the HiFlo Lite products and is perfect for installing behind built-in cabinetry, in projector enclosures, or in recessed TV applications when venting will be necessary once the home is complete. Duct Box - 4x8 (VS-WDB-HF) - This box is for use with the HiFlo products and is perfect for installing behind built-in cabinetry (for very aggressive cooling) or in rooms or closets where venting will be required. Duct Box - 4x8 Insulated (VS-CDB-HF-INS) - This box is for use with the HiFlo products and is insulated for use in attics so hot air does not affect the air being vented. 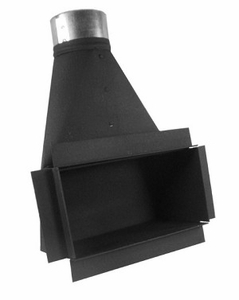 Duct Box for Return Vent System (VS-RVS-BOX) - This box is for roughing in the Return Vent System and is primarily intended to be connected to the home's HVAC return system. Sale Price: (You save: 18%) Vent Hose Reducer - 4" x 3"
Vent Hose Reducer - 4" x 3"